From the back cover: If you were asked to name a dinosaur, the chances are you would give a foreign example, such as Tyrannosaurus rex, despite the term dinosaur’ having been conceived by a British palaeontologist for fossils found in England. In fact, the British Isles have their own tyrannosaurs! The very first descriptions of dinosaurs in the early-mid 1800s were all based upon remains discovered in England. Since their initial discovery, dinosaur fossils have been documented at numerous locations across the British Isles, in England, Wales, Scotland and Northern Ireland. Indeed, the Isle of Wight is often referred to as the dinosaur capital of Europe. British dinosaur diversity is rather high, with theropods, sauropods, ornithopods and thyreophorans (stegosaurs and ankylosaurs) all represented. Remains found across the British Isles represent fragments to complete individuals, comprising unique examples. Following a foreword by the leading British dinosaur scientist Dr Paul Barrett (Natural History Museum, London), the authors summarise what is known about the history of every dinosaur species discovered within the British Isles. They include photographs of hundreds of fossils, many of which are usually hidden from view behind the scenes in various museum collections. These are supplemented by scientifically accurate skeletal reconstructions and vivid life reconstructions of how some of the animals most probably appeared when alive. 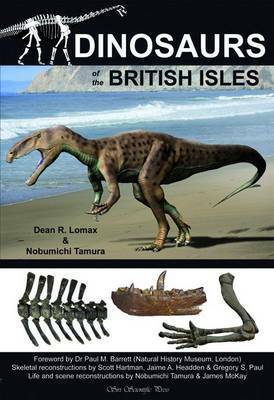 This book is truly unique, providing the first comprehensive account on the dinosaurs of the entire British Isles. It will be of interest to a broad audience, from academics to those with a general interest in fossils. It will no doubt form, in part, the early inspiration for some readers to consider palaeontology as a future career.